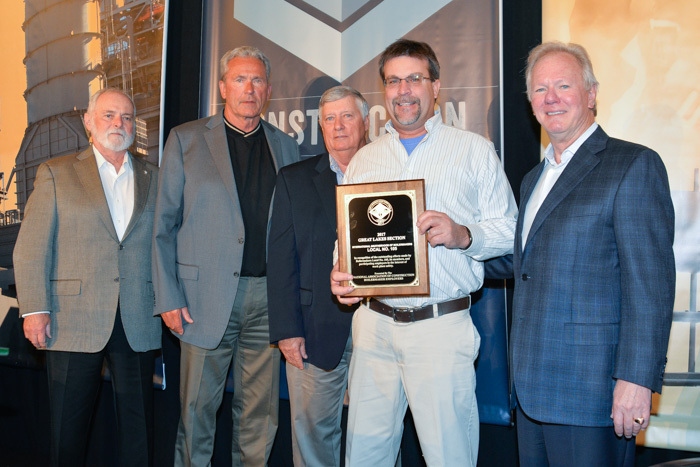 SCOTT HAMMOND, BM-ST of Local 105 (Piketon, Ohio), accepts the John F. Erickson NACBE Safety Award on behalf of his lodge during the 2018 Construction Sector Operations Conference in Fort Lauderdale, Florida, March 5. L. to r. are IST Bill Creeden, IVP-GL Larry McManamon, NACBE Executive Director Ron Traxler, Hammond and IP Newton Jones. The National Association of Construction Boilermaker Employers (NACBE) annually recognizes local lodges that exemplify safety, naming one nationwide winner and one winner from each of the remaining U.S. sections. The safety awards are determined by the lowest injury rates followed by the highest percentage of Boilermaker man-hours from NACBE contractors participating in the NACBE safety index. The new award name honors former NACBE Executive Director John F. Erickson, who retired last summer. In addition to L-105’s nationwide win, the three lodges selected for top safety in their sections included Northeast Local 5, Zone 175 (Oswego, New York), accepted by Local 5 BM-ST Steve Ludwigson; Southeast Local 69 (Little Rock, Arkansas), accepted by BM-ST Rodney Allison; and Western States Local 11 (Helena, Montana), accepted on behalf of BM-ST Clinton Penny by IR Tim Ruth. Two additional index measurements showed slight change, with the lost-time rate inching up in 2017 to .22, up from .21 in 2016, and 12 locals recording zero compensable injuries for 2017, down from 14 recorded in 2016. For more information on NACBE and the safety index, visit www.nacbe.com .